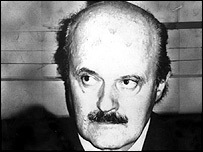 A court in Rome has acquitted all five defendants of murder charges in the 1982 death of Roberto Calvi, known as "God's Banker" for his Vatican ties. Mr Calvi, the chairman of a private Italian bank, Banco Ambrosiano, was found hanging from scaffolding under London's Blackfriars Bridge in 1982. A British inquest ruled the death suicide, but the case was reopened at the insistence of Mr Calvi's family. Mr Calvi died as his bank collapsed in one of Italy's largest fraud scandals. City of London Police, who initially investigated Mr Calvi's death, said it was "disappointing for Roberto Calvi's family in particular that those responsible for his murder have still not faced justice". In a statement, the City of London Police said they had "worked closely with the Italian authorities since 2003 to bring this case to a successful conclusion." Cleared of murder charges are Giuseppe Calo, alleged to be a cashier for the Sicilian Mafia; Mr Calvi's close associate, businessman Flavio Carboni; businessman Ernesto Diotallevi; Mr Calvi's bodyguard and driver Silvano Vittor; and Mr Carboni's ex-girlfriend Manuela Kleinszig. Calo has been in prison since the 1980s on Mafia charges unrelated to Mr Calvi's death. Prosecutors had said Ms Kleinszig should be acquitted due lack of evidence but had asked for life sentences for the other four. The prosecution alleged that they lured Mr Calvi to London and into the hands of his murderers. Mr Calvi was linked to the Vatican bank, and prosecutors also said he was laundering money for the Mafia. Mob bosses feared he knew where their money was going and where it was hidden and was preparing to tell all, prosecutors said. In June 1982, his private bank collapsed with debts of $1.5bn (£750m). An investigation began in Italy but, a few days later, Calvi's body was hanging from Blackfriars Bridge in London. Cash and stones were stuffed into his pockets. The first inquest ruled it was suicide but years later his body was exhumed, revealing clues suggesting he had been murdered. Forensic tests conducted in 2003 concluded there was no evidence on Mr Calvi's shoes and clothing that he had climbed the scaffolding, indicating he had been killed elsewhere. The two-year trial leaves more questions than answers, says the BBC's Christian Fraser in Rome. The defence suggested more than once that there were plenty of others who had a motive for murder - some of them within the Vatican - and they said any number of these parties could have collaborated and silenced Roberto Calvi. An end to the mystery of God's Banker?